Evening sunshine at base camp. Photo: Paul Kirtley. Following the series of storms which hit the UK from December to February, we've had a surprisingly pleasant spring so far in 2014. 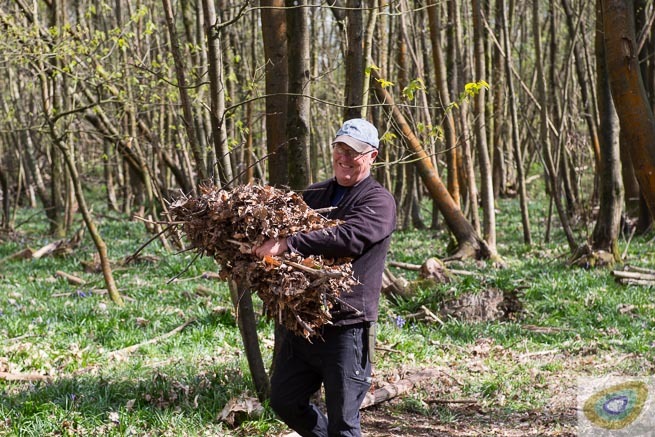 After January being the wettest winter month in 250 years, the dry weather since has left the ground at our woodland course venue in Sussex the driest we've seen for April for some years. Also, compared to the frigid Arctic air which blew from the north in early April 2013 for our Easter Weekend courses last year, April 2014 has felt consistently balmy. 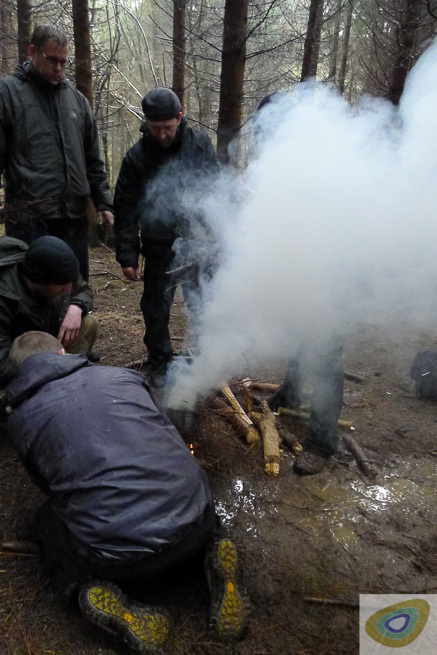 We'd had great weather for our recent Frontier Bushcraft staff training and this continued right up to Easter. The combination of a late Easter and warmer weather felt strangely luxurious. Surely it couldn't last? 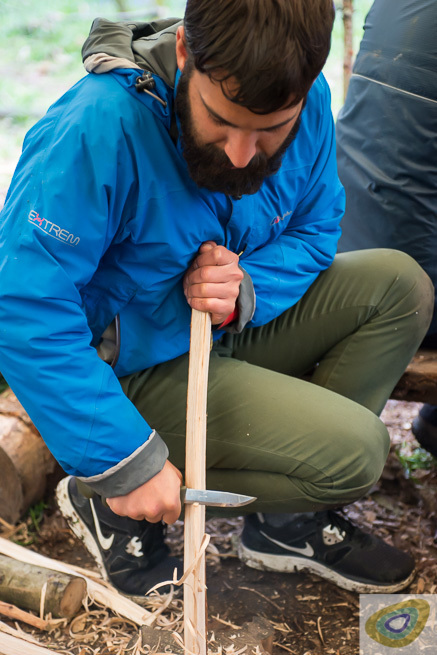 We kicked off the long weekend with a great group of people for our 1-day Bushcraft and Survival Foundation Course on Good Friday. We rattled through the packed syllabus during what is always a full day and only in the last half hour of the course did I feel a few spots of rain. As the tired but happy, smiling course participants headed home, the black cloud passed over and we remained dry for the evening. 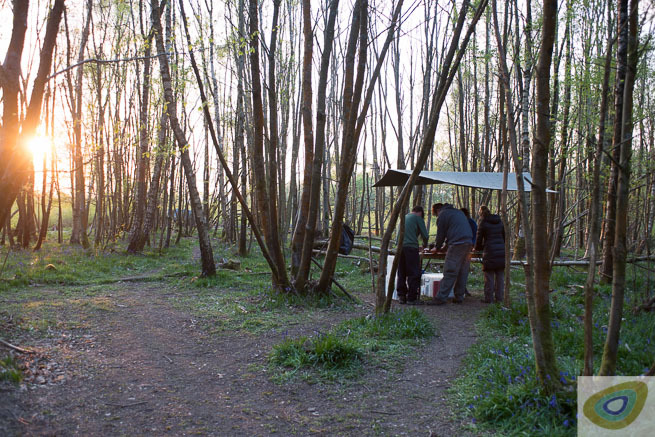 The next morning we greeted eight clients for our 2-day Bushcraft Essentials Course as well as yet more sunshine. It had been colder overnight than in recent days and it was still warming up but it was set to be another very nice day. We deposited vehicles at the parking spot then walked up to our wooded base camp. 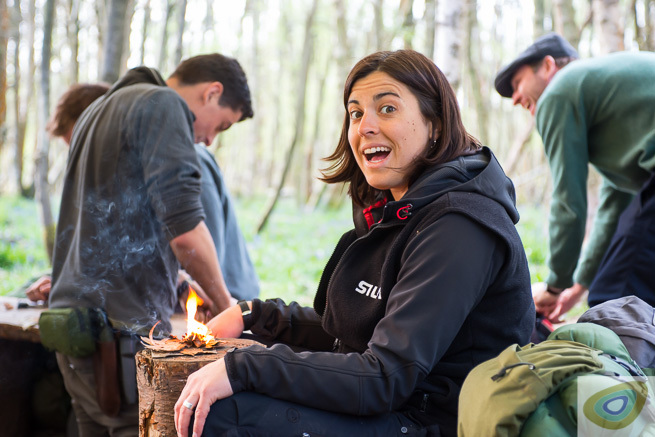 As well as welcoming new faces to our campfire, it was great to welcome back some friends on this course too. Mark Yates from The Urban Bushcraft Podcast and Astrid Callomon, who recently wrote a series of articles for this blog on her experiences walking the 2,661 mile Pacific Crest Trail, were both in attendance. As we went round the group making introductions, it was clear we had eight keen and motivated individuals to work with over the following two days. 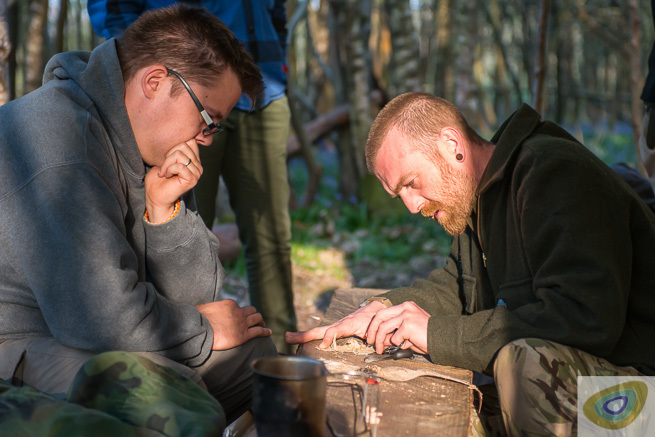 Some had specific areas of bushcraft skill they wanted to work on, others had a particular outdoor goal in mind, for which this course was to be part of their foundational skill set. 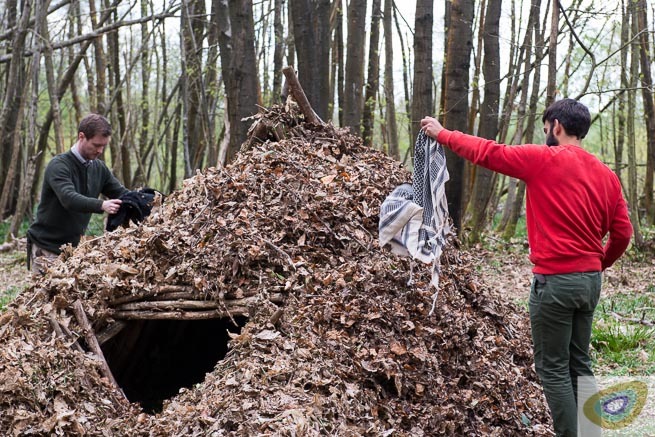 Course participants pulled out the stops to ensure the shelter was well-covered. Photo: Paul Kirtley. The first day went swiftly, with everyone working hard and picking up new skills quickly. 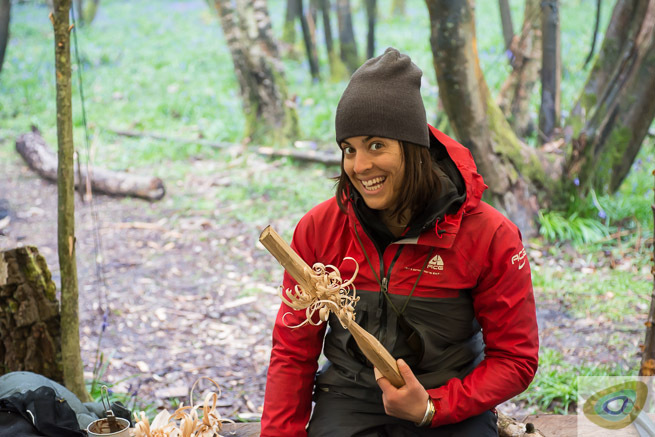 Knife use and safety, tarps and tarp knots, natural shelters, flint and steel, FireSteels, natural tinders, fire lays and small stick fires were covered and practiced before the clients cooked a hearty dinner on campfires in groups. Discussing the finer points of technique. Photo: Paul Kirtley. We turned Astrid into a pyromaniac. Photo: Paul Kirtley. Stuart helps Mark refine his technique. Photo: Paul Kirtley. Getting the fire going for dinner. Photo: Paul Kirtley. After dinner we gathered together for me to provide tips on how to get the most out of sleeping under tarps and have the most warm and comfortable night. This was particularly useful for this who had not slept out in this way before. Despite the forecast for early rain another dry morning followed on Sunday and after some early morning firelighting practice, everyone fuelled themselves up with bannock, bacon and billy can coffee. Around 09:00 the rain started and after taking down tarps, this was the perfect backdrop to introduce feathersticks. This was something Mark had wanted to work on in particular. 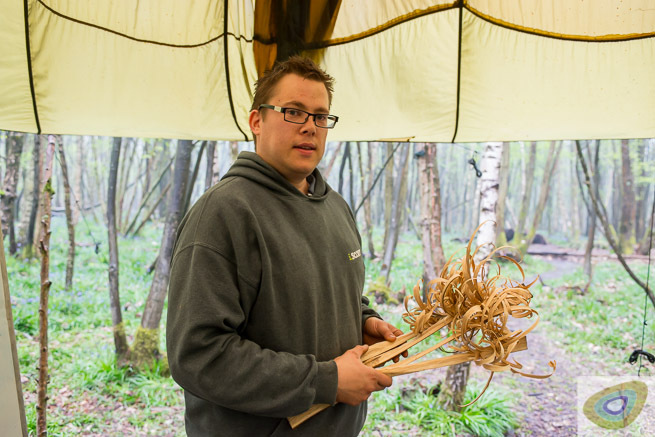 Being able to create a featherstick from the dry centre of dead, standing wood is a great skill to own as it means you can always produce dry kindling. 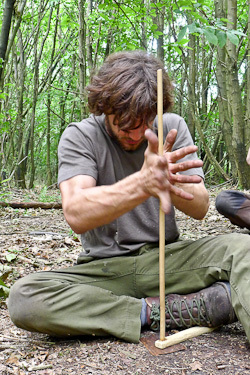 Getting to grips with featherstick technique. Photo: Paul Kirtley. After a little while, some really nice featherstick curls were being produced. Photo: Paul Kirtley. Mark puts on his happy face to celebrate getting the hang of feathersticks. Photo: Paul Kirtley. Some of the group found the technique challenging while others broke through blocks they'd previously had with achieving good feathersticks. By the end of the session everyone was producing decent curls, although not all of them were remaining on the sticks! After a successful group firelighting exercise, I went through how to sharpen their knives, all of which had seen some use since the previous morning. With knives sharpened and stropped and lunch consumed, we headed out to another part of the woods, for the final afternoon of the course. The rain had eased off somewhat and it was looking quite bright again. 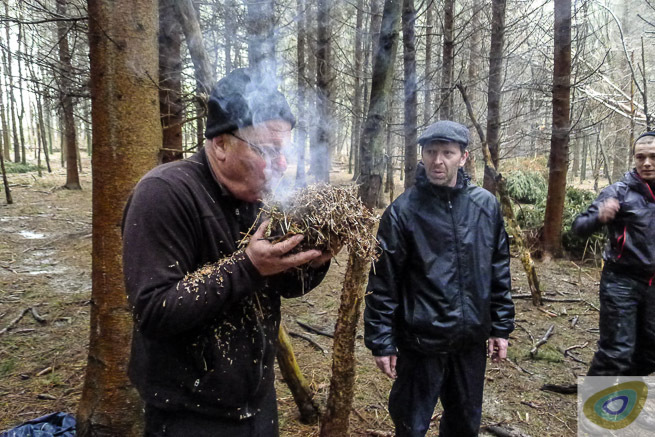 This last section of the Bushcraft Essentials programme is always challenging. 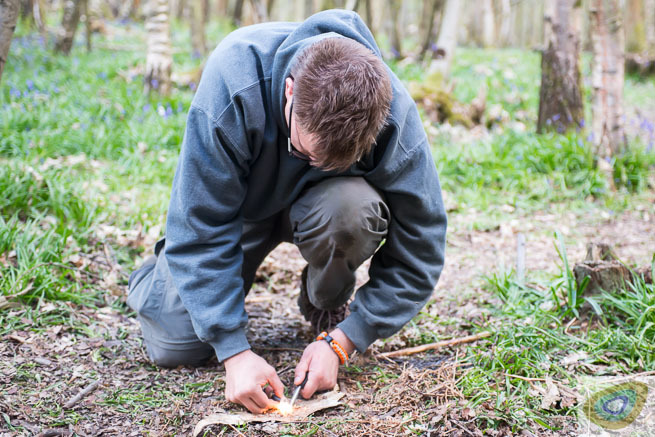 The major part of the afternoon is introducing fire by friction, which is completed as a group activity - rather than individually as it is on our Elementary Wilderness Bushcraft Course. We headed into a block of mature spruce plantation, which is dingy at the best of times. 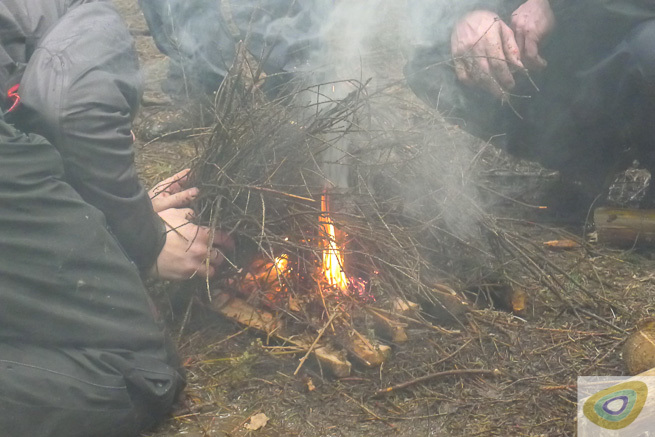 As the two groups of four collected materials for their fires, the rain intensified again. This was going to be an interesting afternoon. 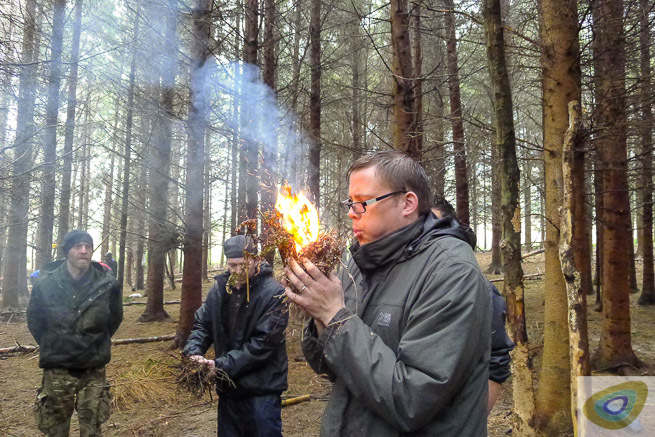 Collecting fire lighting materials amongst the spruce. Photo: Paul Kirtley. 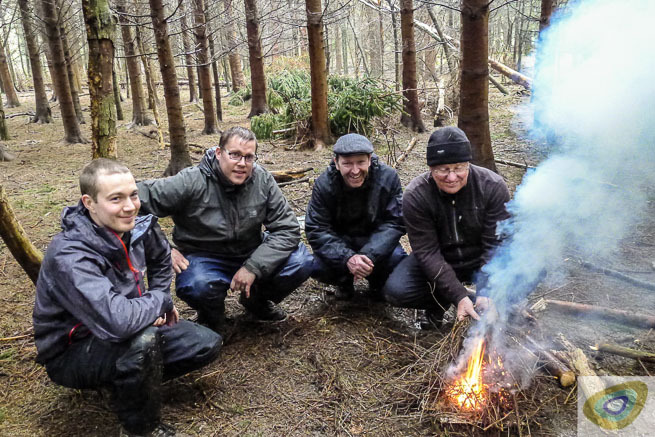 While I headed to the nearby stream with the group to talk through water purification, Stuart, Ray and Paul collected all the materials needed to light our demonstration fire. Water was collected and left to run through Millbank bags. Then, everyone gathered for a bow drill demonstration in the rain. And when I say rain, it really was raining at this point. The sky had gone that sickly green colour that cumulonimbus clouds can create. Between us the bow drill set was created there and then in those woods. Everything at the level of atmospheric moisture. Only the tinder had been collected early - just after breakfast, as we saw it was about to rain then. The three guys who were assisting me gave a textbook bow-drill demonstration. Once the set was bedded in, they produced a stonking, big ember. Ray's jacket was held over proceedings the whole time, so no massive raindrops could smash the ember or wet the bundle of dry bracken. Before long, the fire was established and built up so that people could dry off next to it if necessary. It was now the students' turn. I briefed everyone - the conditions were challenging; most had never even attempted friction firelighting before; they'd certainly never worked together in these groups to achieve it. But they had worked very well together over the past day and a half and all were still motivated despite looking somewhat bedraggled. Moreover, these were conditions to really learn in. 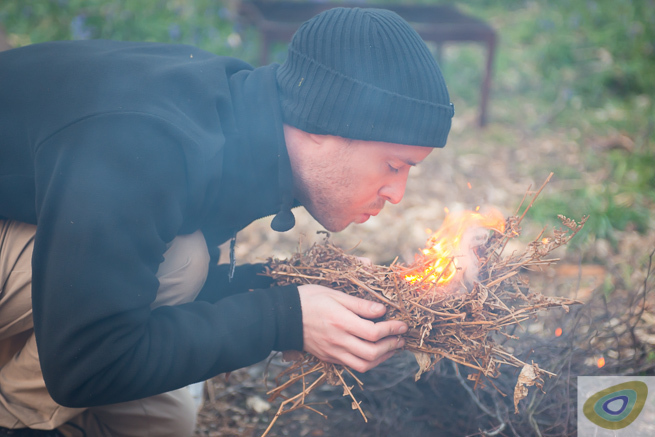 These were the conditions where being able to create a fire from nothing would count most. And if they did succeed, they'd fully believe in it whatever the weather, whereas when you achieve friction fire for the first time in dry conditions, there's always a niggling doubt in your mind if it would work in the wet. 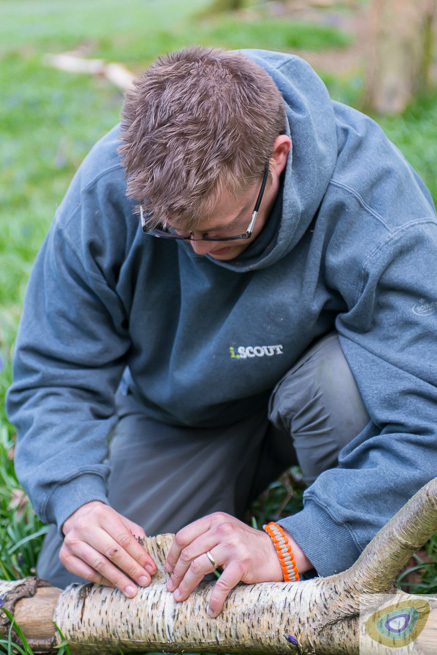 In their groups of four, they set to work, making the four components of their bow drill sets, modelling them on what the Frontier team had made shortly before. They then got down and started drilling, two on the bow, one more ready to take over if someone became tired. 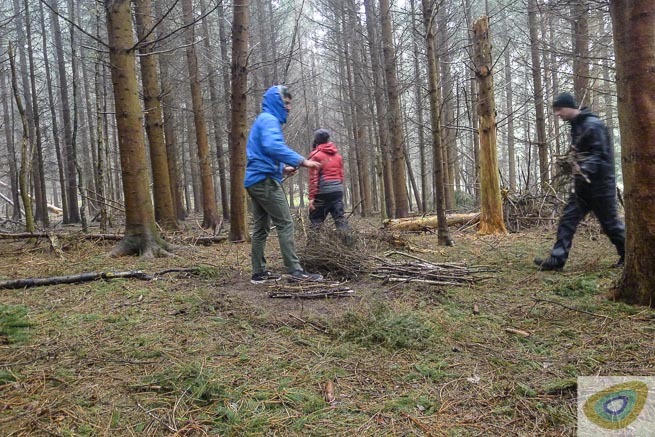 The two who weren't drilling were also ready with a ball of bracken and a mass of fine spruce stick kindling. What followed over the next couple of hours was a monumental effort on the part of both groups to achieve a fire by friction, not just an ember, not just a flicker of a flame, but an established fire. Both groups achieved embers but the damp conditions worked against them, with their smouldering piles of dust not having enough heat to make it. Then one group got their ember into their tinder, only for them to lose it before achieving flame. Back to the drilling… Finally, one group achieved success but it was touch and go all the way. It proved, however, the validity of not just the technique but also everything else we'd taught them about preparation of materials, the quantities required and attention to detail. 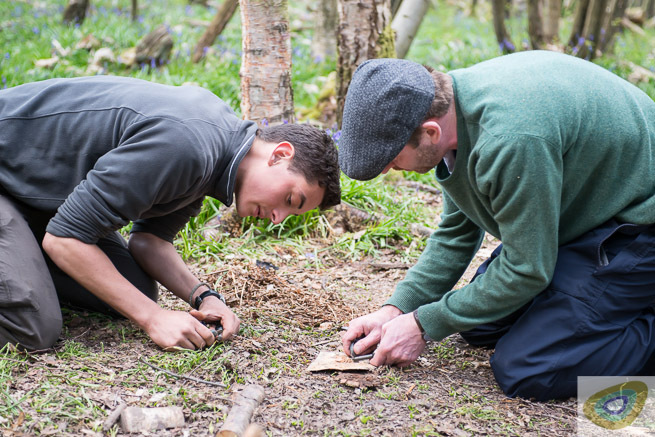 Previously on this blog I've written about why we teach firelighting the way we do and this was another day which hammered these points home. Mark feels the pressure but takes the ember to flame. Photo: Paul Kirtley. Smoke! The fire stuggles in the wet conditions. Photo: Paul Kirtley. Finally the fire starts to establish but it's still touch and go. Photo: Paul Kirtley. Smiles all round. Photo: Paul Kirtley. The second group were so very, very close on a number of occasions. I do believe that they would have succeeded if I had not called time on the exercise. The look of determination, the shaking hands and pure grit demonstrated clearly that at the heart of success is an ability to maintain a positive mental attitude. Both groups had given their best. Everyone had good technique at the end. On a dry day both groups would crush it. Even on this soggy afternoon in a dank plantation they all had achieved a tangible skill as well as demonstrated and strengthened their will to succeed. It had rained continuously all afternoon. The woods had filled with puddles. Yet, they had not given in. 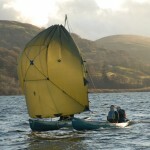 The course had already run over time; all the instructors were happy to stay as long as necessary but some of the participants had other commitments they had to fulfill. So it was that we called it a day. I had made a brew of water mint, nettle and ground ivy and everyone partook for some well-earned refreshment. After a quick but thorough session of leave-no-trace, we headed back to base camp. By the time we left the spruce, the rain had stopped and the sun was coming out! 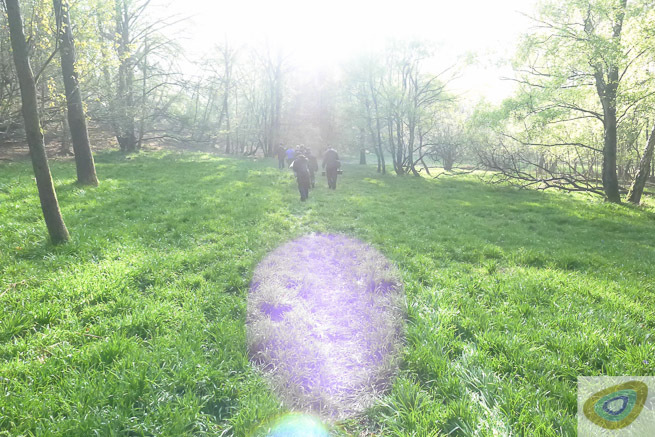 A remarkable turnaround - the sun came out as we walked back to camp! Photo: Paul Kirtley. Loan kit was returned to us and then after a few closing remarks from me, I walked with everyone back to their cars. By the time we reached them, the sky was blue and the birds were singing again. A remarkable contrast to just an hour or so before. What was more remarkable, though, was the tough determination and positive mental attitude which had been demonstrated by everyone on the course. 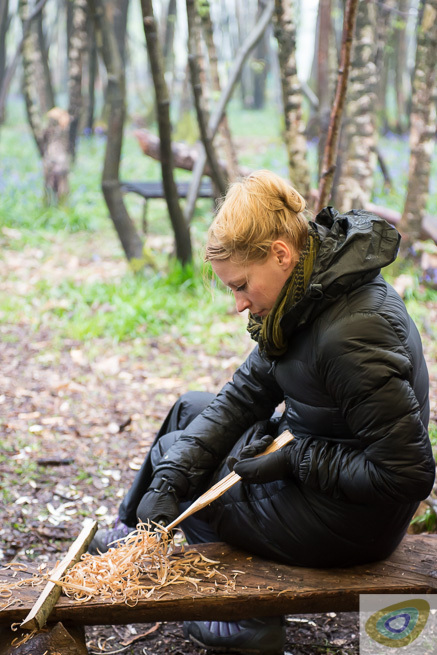 More than the hard, practical skills it provides, developing people's inner strength and determination is why I teach bushcraft. Very well done to course participants on the the fire by bowdrill in the rain thats a real result for a first attempt. Good to hear from you. It’s great that this has brought back some happy memories. That was a great week we had for that course. Nearly two years ago…can you believe it?! Wow! Happy times indeed. What a great experience for all involved. Wish I was there. Oh I plan to definitely. There are at least 3 courses I want to do! Great stuff Liam. Let me know if you have questions on any of them. GREAT group, GREAT weather, GREAT food, GREAT instructors, just GREAT.